We are your one stop party rental shop specializing in fun jumps, waterslides, and other inflatable entertainment! We also offer tent, table & chair, and other party rentals. Please explore our page and contact us with any questions or to reserve your rental! Perfect for parties of all sizes! We had a great experience with Ryan and Jamie. They were prompt, kind, and professional. Our group LOVED the bounce house/waterslide we rented for our son's birthday party. Delivery and pick up was easy and convenient. We will definitely use them again! Thanks guys! Lots of family fun on the Fourth of July! Excellent communication and service. Delivery and pick-up were convenient. Staff was friendly and polite. The slide rented was extremely clean and in great condition. We will be renting from BSI again in the future! Thanks, y'all! Very professional, courteous and easy to work with! The kids enjoyed every minute we had it!! Money well spent! Thank you Big South! We rented the biggest slide I've ever seen! All of our family and friends loved it! Thanks for working so well with us! Prices are great and I loved the fact that they set up and take down. They are very nice people and we had an awesome birthday party! I would definitely recommend. I contacted this company recently trying to find an inflatable for my daughters birthday party! I received a response extremely quick! I was quite please with the service provided. Ryan helped answer all of my questions! And provided us with all the details I needed to know once our inflatable arrived. His staff was extremely polite and respectable when they arrived. We were very happy with everything and the experience with this company! I would definitely recommend Ryan and his staff to anyone! Best price! Best service! Best experience! Highly recommended!!!! We rented a slide from them for Good Friday. They set up in a timely fashion and the guy that set it up for super nice and professional. The slide was in mint condition and had no issues. Would definitely rent again!!!! Awesome people, amazing jumps! my kids had an amazing birthday party and the adults had a blast too !! Thanks Ryan and Jamie! Andrew was so nice when he came to set up and even let Robbie help him. We will definitely be renting another jump. Great quality slides! Arrived on-time for both set-up and delivery. Very responsive. The best choice I made for my son's birthday party. All the kids had fun and even a few adults. I would definitely rent from them again. 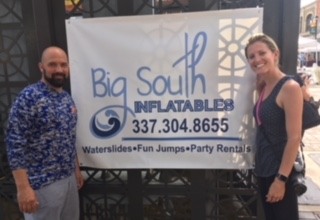 Big South Inflatables, LLC is owned and operated by Ryan and Jamie Monceaux. Ryan is from Iowa, LA. He has 20 years of sales experience in a wide range of areas. Jamie is from Lake Charles, LA and is a Registered Nurse. 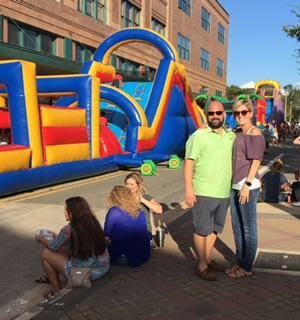 Ryan and Jamie have 2 kids that are the inspiration for Big South Inflatables. They are committed to providing quality inflatables at affordable prices. Big South Inflatables guarantees that you will get the cleanest fun jumps and waterslides in the Lake Area. Every inflatable is sanitized after every use. Not many companies can say that. Please give us a call to reserve your inflatable! © Big South Inflatables 2018. Site design by Michael Shamburger. Businessx theme designed by Acosmin.